Materials disposed of in this bin are turned into high quality compost. Line your kitchen organics bin with newspaper, wrap foodwaste with newspaper or use paper bags to reduce mess and odours. Freeze meat scraps and seafood until collection day. Line the bottom of your bin with leaves or twigs to prevent grass clippings from getting stuck. Please note - Some material is hand-sorted. Please do not place any contamination in your green bin as it impacts on staff and the quality of compost produced. Materials disposed of in this bin are turned into new products. Recycling is one of the easiest things you can do to help the environment and reduce greenhouse gas emissions – Also remember to buy recycled too - use recycled paper, toilet tissue made from recycled office paper, etc. Please rinse containers – you can use the leftover dishwater to save water. Keeping recyclables clean ensures a cleaner recycling facility for our staff. Please do not crush containers if possible – it becomes more difficult for machinery and staff to sort. Please bundle small pieces of paper eg. receipts etc. in a paper bag or cereal box to assist. Please note - Staff in the recycling facility hand sort waste – Please respect our staff by keeping your recyclables clean and not contaminating your bin. 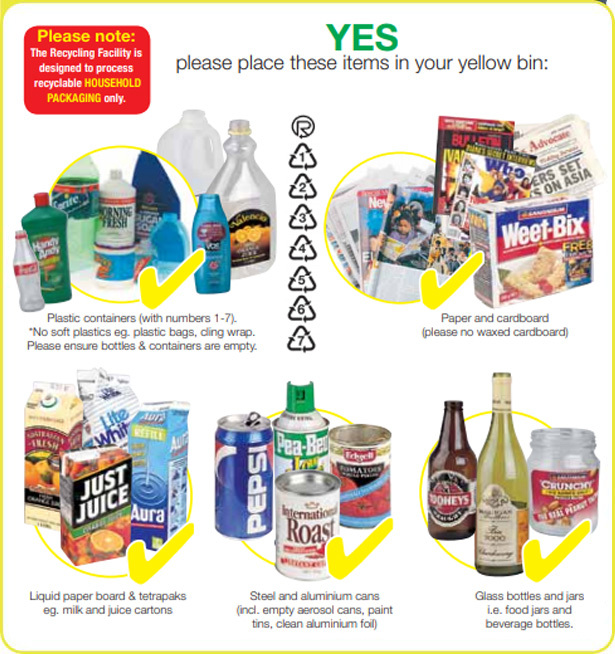 Please note - It costs more money to process material in the red bin than either the green or yellow bins – please separate your foodwaste, greenwaste and recyclables from garbage. The average family should never normally fill their red bin (the average fill should be less than 30%) – please put as little in the red bin as possible through separating your waste correctly. Avoid buying products which have non-recyclable packaging. Avoid plastic bags by using re-usable bags where possible. Please note - Some materials processed in the RESOURCE RECOVERY FACILITY are hand-sorted. Please do not endanger our staff by placing any hazardous waste in your bin.